The LIFE LIFEGENMON is an European project for the development of a forest genetic monitoring system. Selected monitoring sites for European beech and Silver fir are located in Germany, Greece and Slovenia. The project staff presented their relevant practical experiences and findings to participants of 19th European Forum on Urban Forestry in a parallel session at the Ljubljana Castle on June 1st 2016. 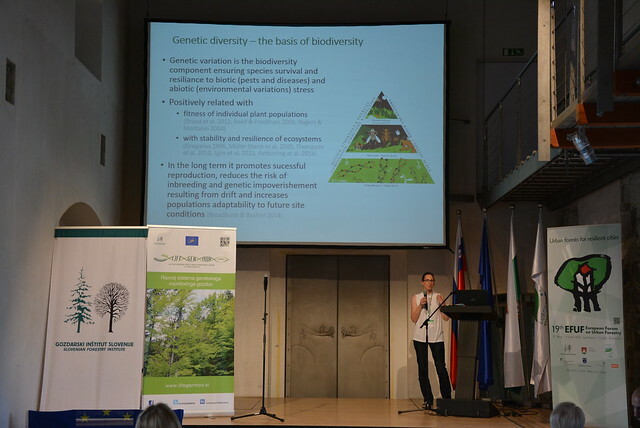 The first speaker was the project coordinator, Prof. Dr. Hojka Kraigher from the Slovenian Forestry Institute. She opened the session of EFUF 2016 with a brief theoretical explanation of forest genetics and concluded the presentation of the LIFEGENMON project. She explained that genetic diversity level is the basis for all higher levels of biodiversity (species, ecosystem) and that forest genetic resources are threatened by several factors, the most important of which is climate change. She also highlighted the work of the European Forest Genetic Resources Programme (EUFORGEN). The second presentation was more specific – Domen Finžgar (Slovenian Forestry Institute) gave a very interesting lecture about the use of UAV (drones) in forestry. He is a part of the multidisciplinary team that developed the prototype of LUCANUS, a remotely controlled drone for collecting samples in tree canopies and stated that: “Drone sampling is not science-fiction, but possible fiction. It is an unique, cost-effective, precise and safe tool.” This contribution will certainly aid to remote data sensing techniques. Dr. Marjana Westergren discussed the importance of forest genetics for (peri)-urban woodlands and emphasized that if we want urban forest to thrive and be resilient, we have to use our knowledge of forest genetics. That means that we need to ensure sufficient gene flow in urban forests by collecting diverse seed for sowing and planting. Genetic monitoring might be especially important in (peri)-urban forests as an early warning system of changes that are about to happen at the ecosystem level. To close the session, Dr. Evangelia Avramidou from the Aristotle University of Thessaloniki (Greece) presented how trees, growing in polluted metropolitan areas of Thessaloniki, showed different phenotypic response to urban environment stresses. She stated that forest genetic monitoring is crucial for future forest ecosystem protection and is invaluable tool for sustainable forest management. To a casual observer, the LIFEGENMON project might not have much in common with urban forestry. But after a closer look, the existing knowledge and research in the field of forest genetics can really help us understand how trees, exposed to an array of abiotic and biotic stresses in (fragmented) forest ecosystems in urbanized areas, can adapt, be more resilient and survive in the future.